Kenneth Hamilton's book engagingly and lucidly dissects the oft-invoked myth of a Great Tradition, or Golden Age of Pianism. It is written both for players and for members of their audiences by a pianist who believes that scholarship and readability can go hand-in-hand. Hamilton discusses in meticulous yet lively detail the performance-style of great pianists from Liszt to Paderewski, and delves into the far-from-inevitable development of the piano recital. 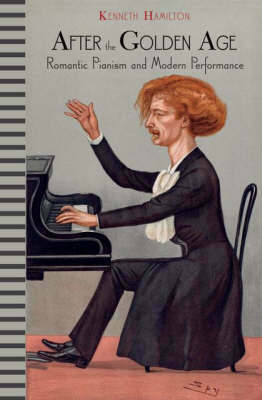 He entertainingly recounts how classical concerts evolved from exuberant, sometimes riotous events into the formal, funereal trotting out of predictable pieces they can be today, how an often unhistorical "respect for the score" began to replace pianists' improvisations and adaptations, and how the clinical custom arose that an audience should be seen and not heard. Pianists will find food for thought here on their repertoire and the traditions of its performance. Hamilton chronicles why pianists of the past did not always begin a piece with the first note of the score, nor end with the last. He emphasizes that anxiety over wrong notes is a relatively recent psychosis, and playing entirely from memory a relatively recent requirement. Audiences will encounter a vivid account of how drastically different are the recitals they attend compared to concerts of the past, and how their own role has diminished from noisily active participants in the concert experience to passive recipients of artistic benediction from the stage. They will discover when cowed listeners eventually stopped applauding between movements, and why they stopped talking loudly during them. The book's broad message proclaims that there is nothing divinely ordained about our own concert-practices, programming and piano-performance styles. Many aspects of the modern approach are unhistorical-some laudable, some merely ludicrous. They are also far removed from those fondly, if deceptively, remembered as constituting a Golden Age.